The Connecticut climate is called humid-continental. There are big changes in temperature throughout the year, otherwise known as 4 seasons. The climate along Long Island Sound is 1 zone more temperate than just 10 miles inland. The northern portion of the state tends to have more extreme winters. Connecticut's manufacturing base has been seriously eroded and the state struggles to make ends meet. Still, inflation adjusted 2010-14 household income of over $69,899 is one of the highest of any state (U.S. HH income was $53,482). Median home prices can differ widely by area. The median home value in the state was $241,400 in late 2016 according to Zillow.com. In Greenwich a starter home is $1 million, whereas the 2nd quarter of 2016 median price in the Hartford/West Hartford area was $236,900 and New Haven $224,000 - just under the national median of $240,000 (NAR). CT is expensive, it has the 45th lowest cost of living of any state. Tax Burden: Connecticut is one of the highest taxed states in the country in spite of a wealthy population and significant revenues from the state's Indian casinos. In 2012 the state had the 2nd highest state/local tax burden of any state at 12.6%. Marginal Income Tax Rates. Its top marginal income tax rate is 6.99% kicking in at just over $500,000 for single filers and $1 million for couples. See this page for Tax Information for Seniors. The personal exemption is a relatively high $12,000. Retirement Income Exemptions. Military pensions are exempt. Social security exemption. Although Connecticut is one of the top taxing states in the nation, social security income is exempt on couples with adjusted gross income of $60,000 or less (partially exempt above that). Sales Tax: State sales tax is 6.35%. Property Taxes: Property taxes can be quite high in many communities. According to Tax-rates.org the state has the 2nd highest median property tax at $2726 per capita annually. Homestead Exemption. Homeowners can exempt up to $75,000 of their home or other property covered by the exemption. The exemption program applies to seniors and the disabled, but there are income restrictions. Estate and/or Inheritance Taxes. Connecticut imposes an estate tax which taxes estates valued at over $2 million. The tax starts at 7.2% and goes to 12%. Link to Connecticut Department of Revenue. Here is information about the social security exemption. Many national and local builders are busy building active adult communities in Connecticut. Active adults will find also find towns that will welcome them - from Avon to Oxford, Southbury, to Willimantic. 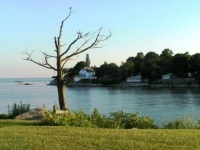 You can live near the Long Island Sound in Madison or Old Saybrook, or even closer to the Rhode Island border in seaport towns like Mystic, Niantic, or Stonington. The Newington and Wallingford areas near Hartford have many active adult communities either built or under construction. Upstate there are rural towns like Sharon, Washington, and Pomfret where there is always something going on, even if it is natural beauty. Connecticut does not have a certified retirement community program. Click on the Connecticut Retirement Community reviews on the right.